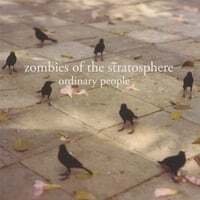 Zombies of the Stratosphere-Ordinary People. Zombies are big these days in pop culture, and if there were any justice in the world the Zombies of the Stratosphere would be as well. This NYC band follows up their excellent 2007 debut The Well-Mannered Look with another collection of quality tunes suffused with a mid-to-late 60s Britpop sensibility, drawing from The Hollies, The Kinks and yes, The Zombies. "Our Life in Shadow Falls" manages a real XTC synthesis, combining Andy Partridge's pastoralism with Colin Moulding's chipper pop, the breezy pop of "Love Song 99" would sound great on an AM radio, and the title track brings a hint of psychedelia to the table. Elsewhere, "Peter Stokes" is the kind of character portrait for which Ray Davies was well-known, and "One Day Older" and "The Other Side of the World" are jaunty retro-pop. Lurch over to one of the links below and check these guys out. Orange & Atlas-Euphoria. Orange & Atlas is a Dallas-by-way-of-Oklahoma band fronted by Erick Orange and Atlas Levan, and they're another in a long line of Midwestern pop/rockers in the vein of Gin Blossoms and (a mellower) Fastball, and their latest release Euphoria is a treasure of mid-tempo pop. Opener "Drunk Love" sets the moody tone, and "This Letter" is pure pop bliss with a yearning melody and a vaguely jazzy feel. "I Fall" recalls the late great Wanderlust (Scot Sax's band), and "Kids Are Falling" has an anthemic quality to it. While this may invoke a mild Euphoria, it's a euphoria nonetheless. thanks for the suggestions. I'm always looking for new music. I previewed Orange & Atlas on iTunes and it grabbed from just the first few seconds. As I'm a huge fan of New Miserable Experience I think that I'll love this album.